She came out to her parents. What they did next will warm your heart. Coming out as lesbian, gay, bisexual, transgender or queer is stressful even under the most accepting circumstances. For some LGBTQ people, it can be downright dangerous. But the times are changing, and this family is proof. 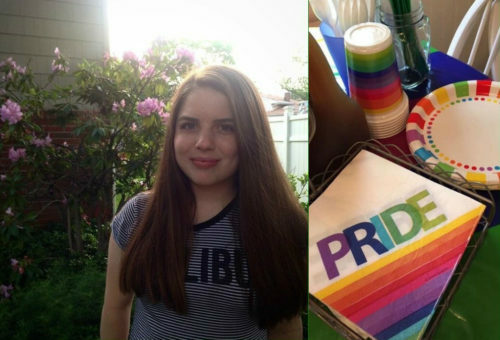 New Jersey teen Kinsey Ratzman, 17, recently came out to her parents, and rather than being handed a stack of Bible verses, sent to a “therapist,” or kicked out, she was shown a colorful display of support from her family. Kinsey tells Buzzfeed that last weekend, her parents said they were throwing an early Fourth of July party and sent her off to the mall with a cousin. When she returned, Kinsey found their home awash in rainbows. Decorations, cake, pasta salad, veggie skewers—everything was decked out in rainbow colors. Yup, they threw Kinsey her own personal pride party. Since her heartwarming story started spreading on social media, Ratzman said she’s received an outpouring of messages from other LGBTQ teens and allies. Her initial Twitter post has received some 30,000 likes and 12,000 retweets. And while not all the messages are positive, she’s ignoring the haters.